Stanford law professor Paul Goldstein and his novel Havana Requiem have been awarded the third annual Harper Lee Prize for Legal Fiction. The prize will be awarded at a ceremony in Washington, D.C. on Sept. 19, in conjunction with the National Book Festival. The prize, named for the Pulitzer Prize-winning author of To Kill A Mockingbird, is sponsored by the ABA Journal and the University of Alabama Law School. It is awarded each year to the novel that best exemplifies the role of lawyers in society. Past winners include John Grisham and Michael Connelly. The novel chronicles efforts by a lawyer, recovering alcoholic Michael Seeley, to help a group of aging Cuban jazz musicians and their families reclaim copyrights to their works. When his main client, Héctor Reynoso, goes missing, Seeley begins to realize that there is more to the story than music, and that a far deeper conspiracy is involved that might include both the Cuban secret police and his former law firm. Goldstein, 70, who writes and lectures on intellectual property issues, is also the author of two other novels, Errors and Omissions and A Patent Lie. He said he sees a connection between his protagonist, Michael Seeley, and Harper Lee’s iconic lawyer-hero Atticus Finch. Judges for the contest included bestselling authors, Michael Connelly and Richard North Patterson; syndicated talk show host Katie Couric; Morris Dees, co-founder and chief trial counsel for the Southern Poverty Law Center, and Dr. Sharon Malone, physician married to Attorney General Eric Holder and sister of the University of Alabama alumna Vivian Malone Jones, one of the first two African Americans admitted and first to graduate from the University of Alabama. 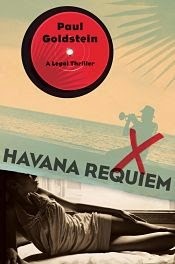 Havana Requiem also won our readers' choice poll, with 39.63 percent of the vote. In addition to his teaching, Goldstein is a member of the bars of New York and California and since 1988 been of counsel to the law firm of Morrison & Foerster, where he advises clients on major intellectual property lawsuits and transactions. Since 1985 Goldstein has been the Lillick Professor of Law at Stanford Law School. Goldstein has testified before congressional committees on intellectual property legislation, been an invited expert at international governmental meetings on copyright issues, and is a member of the editorial boards of leading intellectual property publications in England, Germany and Switzerland. He has served as visiting scholar at the Max Planck Institute for Foreign and International Patent, Copyright and Competition Law in Munich, Germany, and is a member of the founding faculty of the Munich Intellectual Property Law Center. An End to the Off Dual Currency System in Cuba?